The Incredible Hulk is set five years after Bruce Banner’s gamma radiation overdose. This interesting version rates a 7. Edward Norton makes a good Bruce Banner. He clearly wants to avoid hurting other people and his love for Betsy (Liv Tyler) shines through. His acting is outstanding as always. Liv Tyler is not the greatest actress in the world, but she does convey emotion very well. She wants to help Bruce find a cure and feels such concern and fear when he is in danger – it exudes from her every pore. I could not help but feel her pathos. It was wonderful and powerful. William Hurt is the scheming general that was in charge of the original gamma ray project. He wants to get Banner back so that the military can dissect him and create super soldiers. It took me a while to recognize him now that he is so old and has a huge, bushy moustache. Naturally, Stan Lee makes his usual cameo in a cutesy way. The plot was good and interesting. 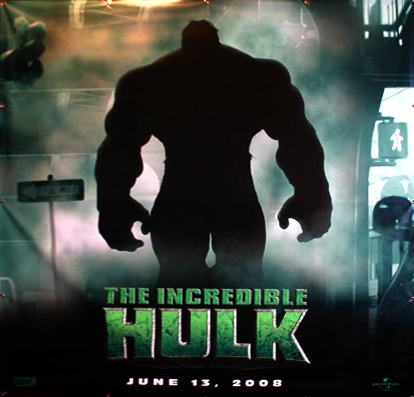 We see the Hulk slowly change from a big, green seething mass of uncontrollable anger into a slightly more reasoning creature that could almost have the potential to become a superhero. Awww. But it was a good story that one could believe. The climactic fight at the end was pretty intense. It was big and splashy making me jump around in my seat as big chunks of stuff was thrown about and bodies slammed through things. All of this was felt through the filter of Betsy’s concern for the safety of her big, green guy. And surprise, surprise, Tony Stark makes an appearance. Nice.